for $79,900 with 2 bedrooms and 2 full baths. This 928 square foot condo was built in 1974. Must see this well maintained second floor condo that boasts spectacular views overlooking the pool and clubhouse. This is the lowest priced until being sold in this community and it's turnkey! The screened in lanai offers a walk out to a private staircase making the amenities only step away. High end laminate recently installed in the entryway and kitchen. Split floor plan. Master en-suite offers a spacious bedroom and lots of closet space. Oversized storage closet in the unit. Common laundry located a few feet away from the unit. Deeded parking space with guest parking close by. Foxmoor is a quaint but yet active community with low HOA dues. 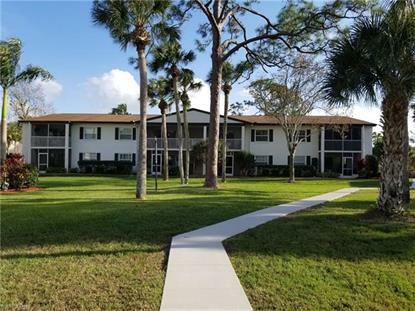 Some of the amenities include: clubhouse, pool, shuffleboard, tennis courts, pickleball, horseshoes, putting green, sauna and a vehicle wash area. Only five miles away to I-75 and Downtown Fort Myers. Close to shopping and restaurants.